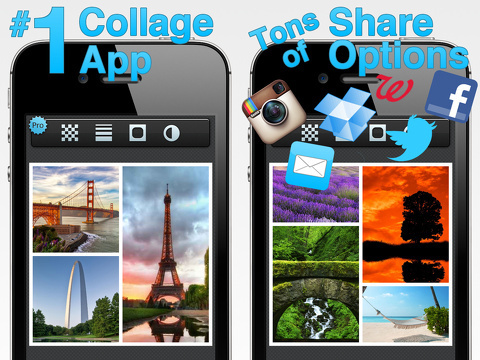 The Pic Stitch iPhone, iPod Touch, and iPad app combines 70 photo collage formats, photo editing tools, and solid sharing choices for free. The Pic Stitch iPhone app has an appealing and generally simple interface, but it brings enough customization options to entice iOS photography app addicts. 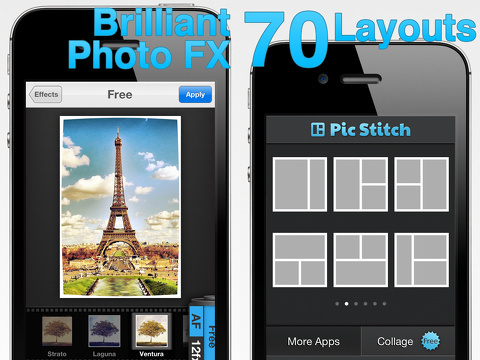 The Pic Stitch iPhone app opens to a matrix grid of photo collage formats. There are eight pages of selections that are accessed with horizontal finger swipes. You simply touch a photo collage arrangement to create one. At the bottom of the photo grids, you can check out other iPhone apps by the developer, connect with Facebook, and purchase an upgrade. When you select a photo collage format, you customize it using sensible gesture controls. To add a photo, you tap an area two times. To edit the photo, you tap once. You can shake your iPhone to clear the collage. You can add photos from your iPhone photo albums, Instagram photos, and Facebook. You can also shoot from the in-app camera. Just below the photo collage, there is a row of icons to access customization features. To change the arrangement of your photo collage, you tap the layout icon to move back to the start screen. The edit icon leads you to a thorough photo editor. Pic Stitch’s iPhone app uses the Aviary iOS photography app photo editor, so those familiar with Aviary will have no learning curve. The Aviary iOS app photo editor has 15 editing and enhancement tools ranging from inserting text to adjusting the light of a photo. The aspect icon allows you to change the size of the photo collage to allow for traditional printing sizes, as well as the chance to create a Facebook cover photo. You can also share your Pic Stitch iPhone app photo collage to Facebook, Twitter, Instagram, email, and your photo album. You can also print to Walgreens and save to Dropbox. The Pic Stitch iPhone app is a free download, but the recommendation to upgrade may be aggressive enough to make you purchase it. Every time you open the Pic Stitch iPhone app, you are prompted to make the in-app purchase. A $.99 upgrade brings you themed borders. The Pic Stitch iPhone app contains more tools than the average user may need, but it has a nice interface that allows you to be creative. You are not required to move through the Pic Stitch iPhone app in a step-by-step process. The interface is concise, so the navigation between adding photos and editing them is never confusing. With Pic Stitch, you can simply insert photos into a collage, or you can finesse the photos to find the perfect, sweet shot. AppSafari review of Pic Stitch was written by Jenni Ward on January 14th, 2013 and categorized under App Store, Free, Fun, iPad apps, Photos, Universal, Utilities. Page viewed 6947 times, 2 so far today. Need help on using these apps? Please read the Help Page. The app has definitely evolved from 2013, but there are still annoying aspects, like the video pop up right in the middle of the editing process.